Fruit fly (Drosophila melanogaster) sitting on a blade of grass and, we have to assume, contemplating the difficulties of staying aloft when you weigh next to nothing. If you can get past the annoyance factor at the cloud of fruit flies swarming above your superannuated cantaloupe or peach you may wonder how the little devils do it. Fly, we mean. The basic problem is stability. With such a tiny mass, they respond disproportionately to wingbeat; the body has precious little momentum, and a puff of wind can blow them off course. As experiments that disabled the fly's built-in biological gyroscope have shown, an errant wingbeat or two could cause a death spiral. So how often does that gyroscope, called the haltere, send a message to the nearby neurons that control steering muscles? Extremely often, is the first-blush answer: Smaller animals tend to move faster than large ones, says Z. Jane Wang, a professor of physics and of mechanical and aerospace engineering at Cornell University. (Compare a California condor to a chickadee, for instance.) With something as miniature as a fruit fly, "that brings up the question, how fast do they sense position, and how fast they can react to correct their course?" says Wang. High-speed video footage of a fruit fly's aerobatics. Objects moving in a fluid, like boats and flies, have three basic types of instability: Pitch, yaw and roll. Could the fly be sensing and reacting that quickly to counter pitch (see-sawing movement of the head and tail)? That's what Wang set out to analyze in the study reported this week. Her computer simulations of the fly's motion showed that the maximum duration of one sense-and-react cycle is three wingbeats -- 12 milliseconds. 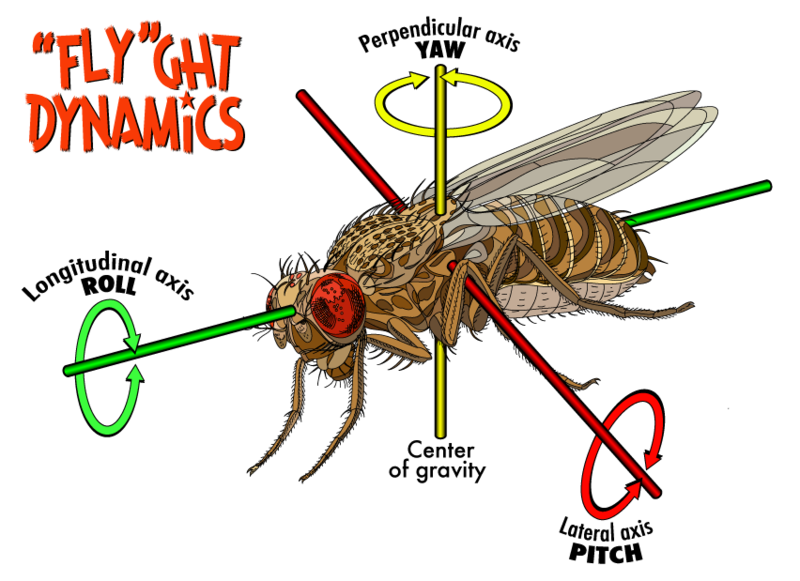 (With slower corrections, the fly would lose control and crash.) The sensing mechanism itself apparently occurs every 4 milliseconds. Wang, a theoretical physicist who flies kites, says "I love watching anything that moves through the air," and calls the dragonfly, which she also studies, "my first love." "I was surprised," she admits. "When you look visually at the response of a fruit fly, it takes 25 milliseconds to respond, so when I first saw our result, my immediate reaction was, 'that's too fast; we better check our answer.'" But the math was sound, and the calculations jibed with the fact that one steering muscle was firing every wingbeat. "Aha, maybe it's there for stability," she says. "Then it got exciting." Still to come, Wang says, are studies of yaw and roll. A flying object -- whether fruit fly, bat or Boeing 787 -- can move forward or back, up or down or side to side. But it also has three types of unstable movements: yaw, pitch and roll. 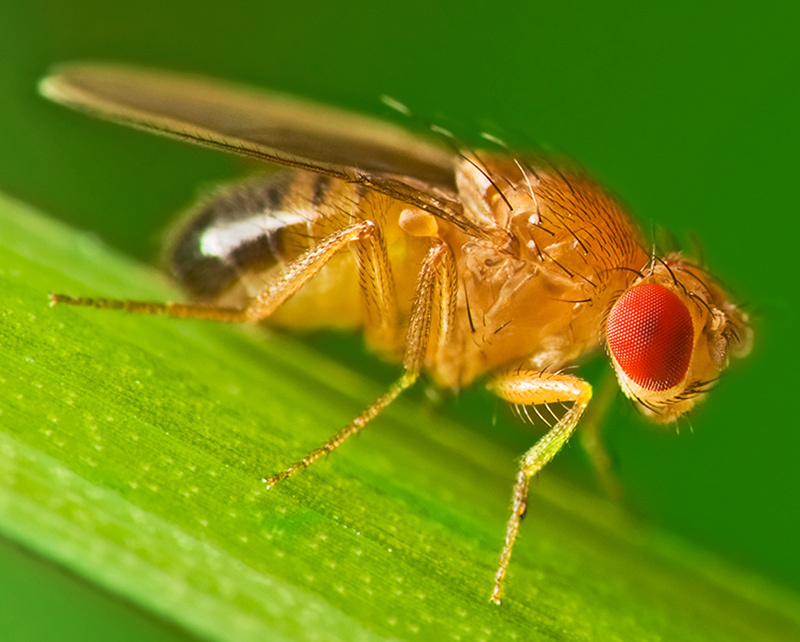 Researchers at Cornell University analyzed the pitch of fruit flies to find out how often a fly senses and stabilizes itself during flight. Female fruit flies lay upwards of 500 eggs under the surface of rotting fruit and other fermenting organics. 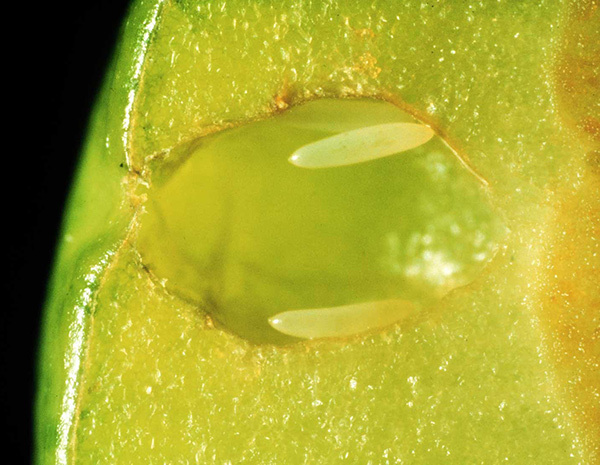 Larvae hatch, then feed on bacteria and yeast growing within the rotting interior. How broadly could this finding apply? The fruit flies are members of the order Diptera (the flies), which come in many sizes. "A lot of neural measurements were done on larger flies, but they are almost identical, in terms of muscular structure and recording neural activity," says Wang. "Because drosophila are also members of the order Diptera, we can apply what we learned to bigger flies." Among birds, the closest analog to the fruit fly's wing motion is the hummingbird, Wang says, but the much larger hummingbird wings beat slower, and vision and tail both aid stability. In terms of inanimate things that fly, "The algorithm we used to compute fruit fly flight will be applicable to robots; it has a direct implication for almost any kind of flight that involves flapping wings," Wang says. "It provides a theoretical framework so we can go beyond a trial and error." It's possible that 4 milliseconds is the speed limit for this type of sensing, Wang says. "If there is something even smaller that flies, it might be faster. But this could be at the borderline."